Ultrathin laptops help you find information, but writing things down, on paper, in a notebook, helps you learn and remember. Wireless headphones make your music better and more portable, but earplugs ensure sleep. And though your smartphone is the camera you always have with you, an instant camera creates actual moments you share with just one person, not the world (on purpose or accidentally). In short: You’re heading to school with a lot of trendsetting new gear, but you still need the stuff that generations of students lugged along, too. At Wirecutter, we research and test both the cutting-edge and the old and solid, and we think these items are the best buys for your college days. 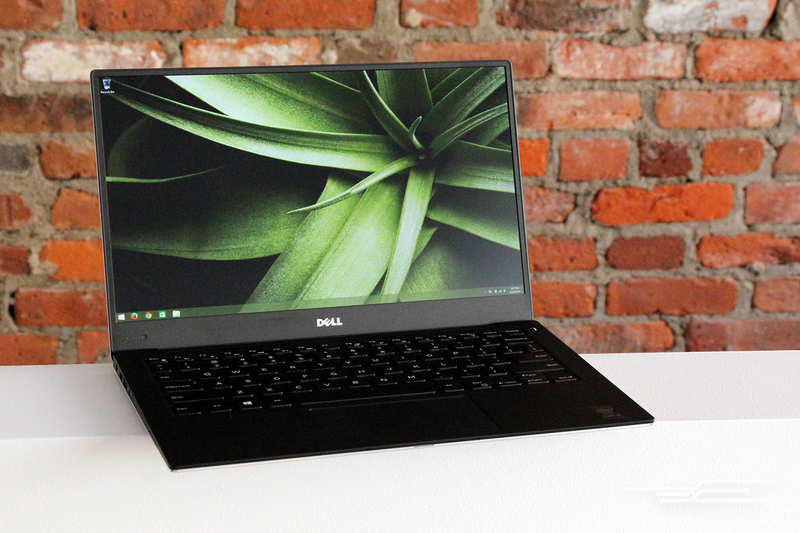 If you need an ultra-portable laptop before school starts, and a Mac isn’t a requirement, you should get a Dell XPS 13 (late-2015 model), the best Windows ultrabook for most people. It has a big, beautiful screen, the longest battery life of any lightweight Windows laptop we tested, a keyboard second only to ThinkPads in quality, a solid trackpad, and the best-designed body. If you need to save some money, the Asus ZenBook UX305UA is a fantastic Windows ultrabook for its price; it has a little less battery life (though still great), and a slightly lesser keyboard and trackpad, but those are reasonable sacrifices. We’d like to recommend a MacBook, but the timing is terrible right now, thanks to a conspicuous lack of current-generation processors and USB-C ports across nearly the whole MacBook line. If you specifically need OS X (soon to be macOS) for school or work, you should try to wait until Apple updates its lineup, which we expect very soon. If you need a Mac now, check out our “Which MacBook Should I Buy” guide. As for the other notebooks—the kind you don’t charge—we recommend the Mead Five Star as the perfect choice for an affordable, single-subject spiral-bound notebook. We picked the Five Star after subjecting some of the most popular notebooks to everyday writing, and then heavy abuse (such as throwing them down stairs and soaking them in water). You can write smoothly and crisply on the Five Star using an array of pens and pencils, with minimal bleed-through with all but the wettest of inks. And because it’s both perforated and hole punched, you can easily remove clean-edged pages or snap the whole thing into a binder. If you’re looking for something a little more affordable (especially if you find it on sale), the basic Mead Spiral has similar paper quality without the bonuses. If you need a pen to take notes in class or to write exam essays, the one to grab is the Uni-ball Jetstream. It’s widely available and it creates one of the smoothest, quickest-drying lines you can find. And if you need a mechanical pencil to go with it, we recommend the Uni-ball Kuru Toga. Unlike any other widely available pencil, the Kuru Toga has a unique ratcheting internal mechanism, so each time you lift the pencil from the page, the lead rotates a tiny amount. What does that mean? The sharpest point of your lead will always touch the paper, and you won’t constantly fidget to rotate the pencil in your hand. A set of comfortable, closed, on-ear headphones is great for enjoying music, videos, or games without disturbing your roommate, or for jamming through a study session at the library. After researching 93 models and testing the 55 best-reviewed and newest models, our headphone experts picked the Jabra Move Wireless as a great set at a great price. Of the Bluetooth headphones we tested in this price range, the Move pair was among the best sounding, beating out models that cost almost twice as much. In fact, it sounded about 75 percent as good as our luxury pick, at less than one-fifth the price. 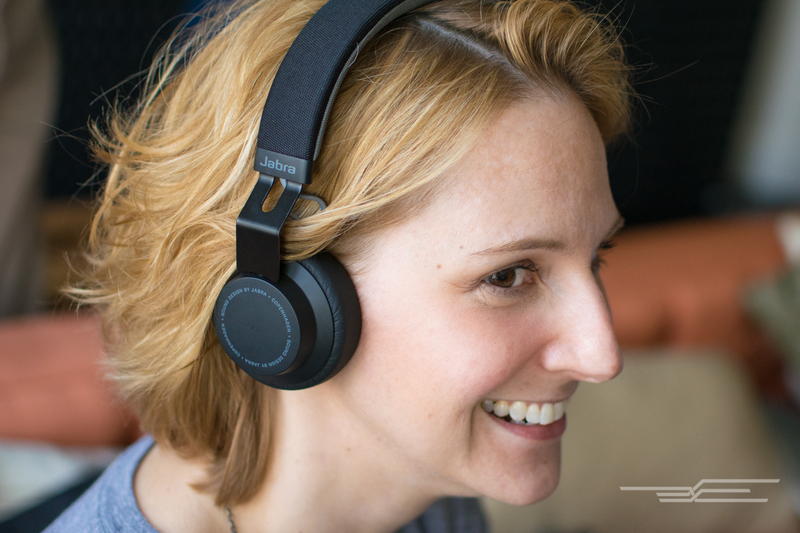 Unlike other Bluetooth headphones, which tend to be full of confusing buttons, the Move offers easy-to-use, easy-to-understand controls and a comfortable feel on your head. Best of all, it’s affordable: You can usually find it for a good amount less than its $100 MSRP. If you need to hear less music (or phone calls, or hall noise) to study or sleep, keep a trusty pair of disposable earplugs handy. We spent several hours researching contenders, tested four top-rated models, and slept in a house next to an airport. Mack’s Ultra Soft Foam Earplugs emerged as the best earplugs for most people. These earplugs’ 32-decibel noise-reduction rating was one of the highest among the models we tested. According to safety-equipment distributor Cooper Safety, that’s enough to reduce the volume of a gas lawnmower to that of a normal conversation. What also makes Mack’s earplugs so effective is their ability to stay in your ear through a whole night and remain comfortable, unlike some of the competition. The Waterfield Vitesse is a great choice whether you get to school via bike, foot, bus, or crowded subway car, and need a stylish bag that can transition well into night use. The Vitesse is surprisingly roomy and tough, with a sleek appearance that looks natural at a party or out to dinner. Its waxed-canvas finish is durable, it’s lightweight at just 1.9 pounds, and though not technically waterproof, it sheds stains and water easily, and cleans up with just a simple wipe-down. 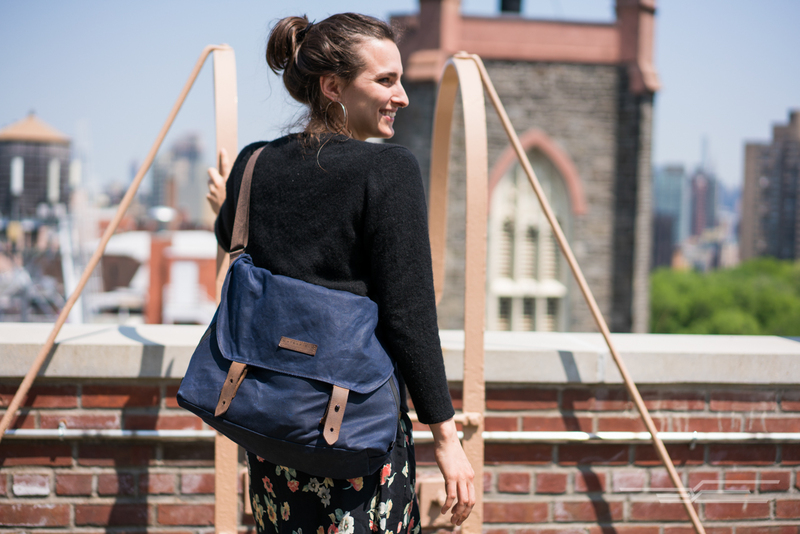 The Vitesse has an unpadded laptop pocket that can accommodate a 15-inch MacBook Pro (though you can add your own sleeve), an accessible front zip pocket, and three small organizing pockets that are perfect for your keys, wallet, and other miscellany. If you prefer the classic look of a backpack, we recommend the L.L.Bean Quad. Compared with similarly priced competitors, our pick balances comfort and a smart blend of school storage and hiking comfort features at a nice price. You can find cheaper bags that’ll hold up fine for a few years at school, and pricier options that might serve you better on a mountain trail, but the Quad is a pick that’s tough, versatile, and affordable. We particularly love its large, zippered exterior pouch that gives you almost instant access to anything from a notebook to a fully packed bag lunch. Its ventilated and mesh-padded back also won’t leave you with a too-sweaty back after a walk in the summertime. You can cobble together a decent dinner using only your rice cooker, and it helps stretch precious student funds. After testing five top-rated rice cookers with a panel of Japanese chefs, we recommend the Hamilton Beach Digital Simplicity Deluxe Rice Cooker/Steamer for quick meals and dining-hall avoidance. Despite retailing for less than half the price of some competitors, the Digital Simplicity earned the top spot in our taste tests for white rice. Its speed was also impressive, as it produced a 3-cup batch of white rice in less than 38 minutes and brown rice in 1 hour, 20 minutes—12 and 25 minutes faster, respectively, than the higher-end Zojirushi NS-TSC10. A delayed-start option, a dedicated steam mode, and a boil-then-simmer function add to the Digital Simplicity’s versatility. Microwaves enable the enjoyment of late-night leftovers, piping-hot popcorn, and even full meals for one in the comfort of your dorm room. 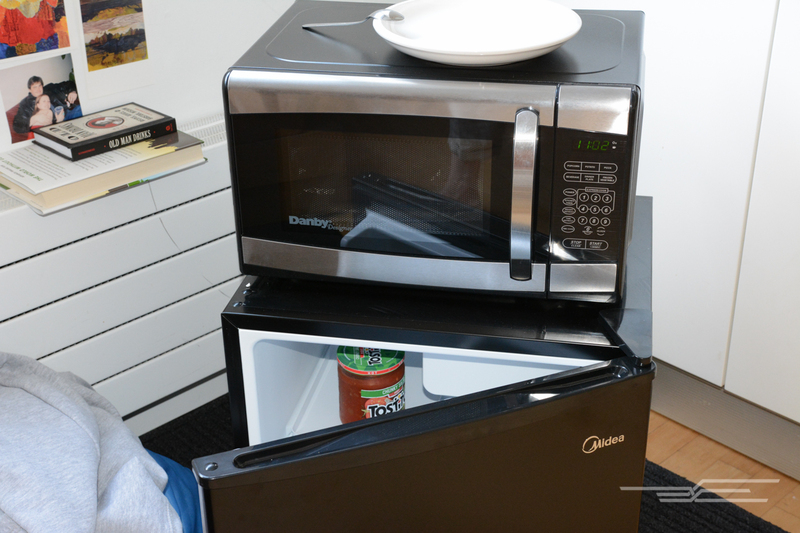 After 18 hours of research and considering eight popular models, we think the Danby Designer Stainless is the best microwave for dorm rooms because it has a handle instead of the more common, ever-breaking push-button door mechanism. The Danby also has a start button that doubles as an “add 30 seconds” button—we learned this was a must-have feature for many people when we researched the best full-size microwaves. At about 17 by 14 by 10 inches, this 0.7-cubic-foot, 700-watt microwave fits perfectly on top of a mini fridge and uses less power than the more common 1,000-watt models, which means it’s less likely to trip your breaker when it’s sharing a circuit with a kettle, the fridge, and your laptop. 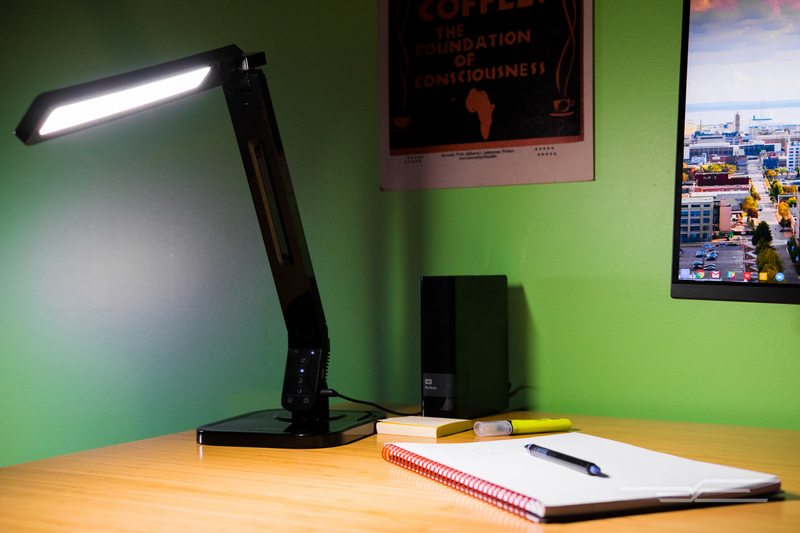 Dorm desks aren’t renowned for their expansive surfaces, so the best desk lamp for a first-year student should be compact, adjustable in height, and sufficiently bright for late-night cram sessions. If you study in the very early morning or late at night—as students are known to do—the Anker Lumos LED Desk Lamp can add the right light mixture to your space. The Lumos has four color modes (Reading, Studying, Relax, and Bedtime) and five brightness levels. Its base rotates 180 degrees, pivots at three points, and has a decent-looking control panel with a sleep timer―all handy features if you’ve got books spread out, or need to accommodate a sleeping roommate. Most lamps with all of those modes and options cost $10 to $30 more than the Lumos. And the Lumos beams its light in a wide, even glow from a continuous panel, not a strip with visible tiny bulbs. The Anker does look a little techy, and though it’s a great value, its price could be a turnoff to those on a tighter budget. For them, the IKEA Forså (available in store only) is an adjustable, attractive, very affordable alternative. It looks better than any multiple-setting LED lamp we saw at a reasonable price, it has a 6-foot-long cord, and a small weighted base that frees up desk pace. The drawback: IKEA sells bulbs for the Forså only with a 2,700-kelvin “warm daylight” temperature, and LED candelabra bulbs with a cooler temperature are uncommon and somewhat pricey. That limitation is fine if you use the Forså exclusively for calm reading or nighttime work. If you use it as your main desk light, your other lighting must be warm, or the conflicting temperatures (colors) may cause discomfort. For reading in bed after a roommate is asleep, a reading light (aka book light) is more discreet. After testing three top-rated lights, we recommend the Mighty Bright XtraFlex2. Compare it with the competition, and you’ll see why the XtraFlex2 is the multiyear best-selling book light on Amazon. On its low brightness setting, it emits just enough light for personal reading, but not so much it leaks beyond the book. And on its high brightness setting, the light is perfect for late-night object searches. Taking better, more interesting iPhone photos can be done at a very reasonable price. For $45, the CamKix Camera Lens Kit provides four lenses―fisheye, combo macro, wide-angle lens, and 8x tele―and a mini-tripod. Though the image quality isn’t the best available, it’s better than anything else at that price, and good for someone who wants to mess around with different lens types. We were initially extremely skeptical of the looks and quality of the multi-lens assortment, especially the shot-glasslike 8x tele. But we were pleasantly surprised by the reasonably good photo quality. Sharing photos to dozens or hundreds of people from a smartphone is easy, but to create something tangible and exclusive, an instant film camera is an analog throwback still worth the price. 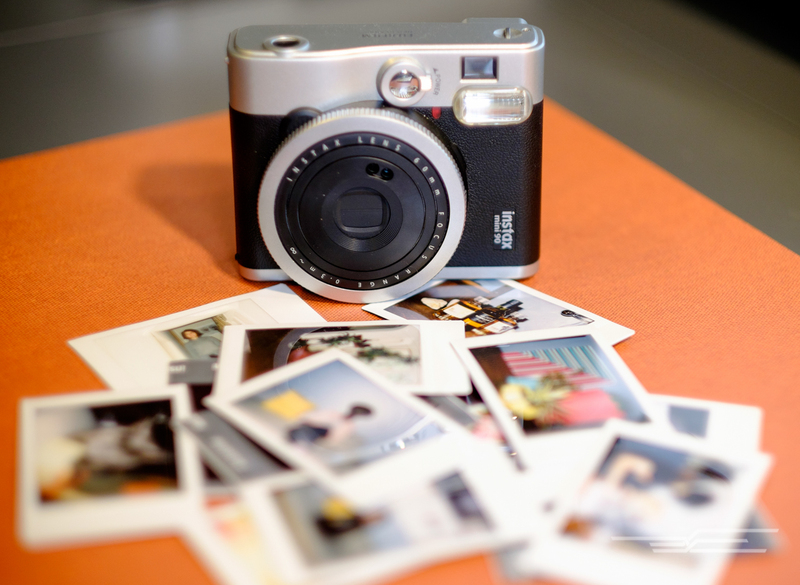 The best instant film camera we’ve found is the Fujifilm Instax Mini 50S. It’s easy (and fun) enough to use that you can pass it around at a party, and it takes better photos than most instant cameras. The Instax film it uses is still widely available, too, and if you want to put more time and effort into it, you still have plenty of manual controls to fiddle around with.